This summer our high school math department will be leaving their old, heavy, dusty textbooks behind and will be developing and moving their curriculum online. While this may seem like a considerable charge (for a team of five) there are several reasons why they decided – Now is the time to move! Money talks – Especially when there is none. Just like most districts in the state of MN, our district is facing budget reductions. There is no money for new textbooks. New Standards – The state of MN has been shifting and restructuring the math standards and many of the current HS math courses need adjusting to match those standards – starting in the 2010-11 school year. 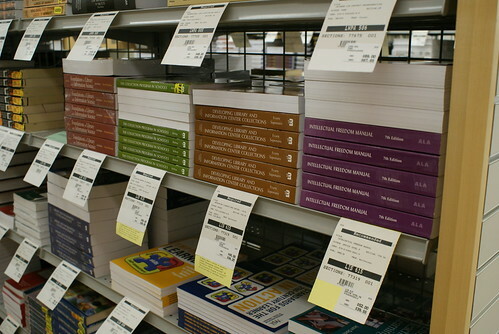 Current textbook Use – The team has identified that the majority of our students do not use textbook as learning resources but use them for homework assignments only. They are heavy, dated, and lack real world application. Learning Styles – Textbooks only address a limited number of learning styles and are generally not for the visual or auditory learners. They are not interactive, very impersonal, and lack the collaborative learning students today crave. Living Curriculum – Since the team will be creating the curriculum – they will also be able to adjust and improve upon the courses as needed. Forever. Future Delivery of Public Education – Reports indicate that half of high school courses could be online by 2019. Governor Pawlenty recently proposed to require every high school graduate, beginning in 2013, to take an online course, participate in an online experience or participate in online experiences. Developing a blended curriculum in the math department will prepare our students AND teachers for the eminent shift in the delivery of public education. There may be many more benefits than the ones I have identified above. There will also be roadblocks that we will have to address. (like computer access) We will tackle those problems as they occur. I am looking forward to this new journey and the opportunities it will give our students!